What is the Quotient Property of Square Roots? The quotient property of square roots if very useful when you're trying to take the square root of a fraction. This property allows you to split the square root between the numerator and denominator of the fraction. 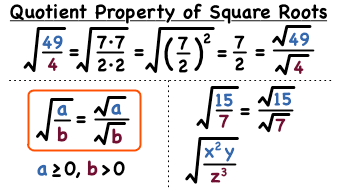 This tutorial introduces you to the quotient property of square roots. Take a look! Why can't you divide by 0? This may be one of the most asked math questions. Get this question answered once and for all by watching this tutorial! Did you know that another word for 'exponent' is 'power'? To learn the meaning of these words and to see some special cases involving exponents, check out this tutorial! How Do You Rationalize a Denominator? When you have a fraction with a radical in the denominator, you need to get that radical out of the denominator in order to simplify that fraction. That means you need to rationalize the denominator! In this tutorial, see how to rationalize the denominator in order to simplify a fraction.